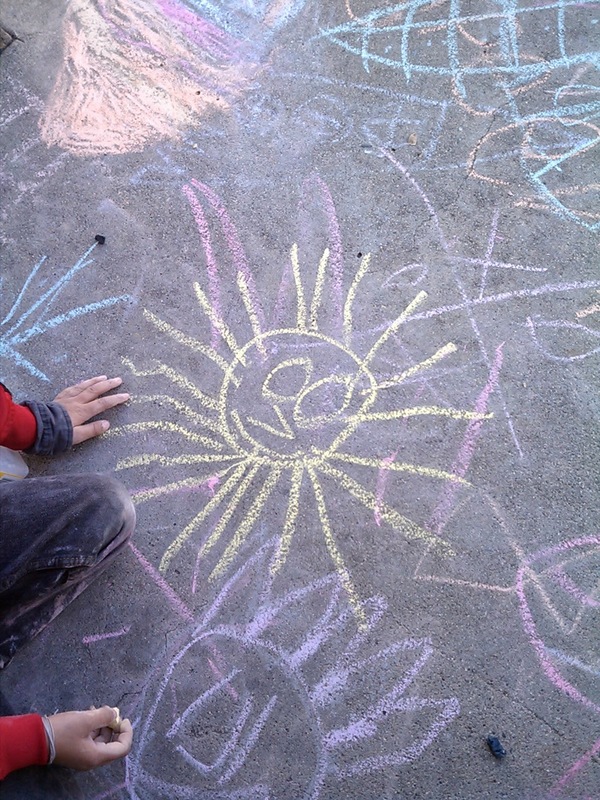 Creating Art With Kids: got chalk? Left to their own devices and given a few simple materials, kids will make art on their own. Shouldn't this tell us something about our innate need to create, to beautify, to express ourselves? Give a Kindergartner some sidewalk chalk and leave him or her alone and some happy things might happen! 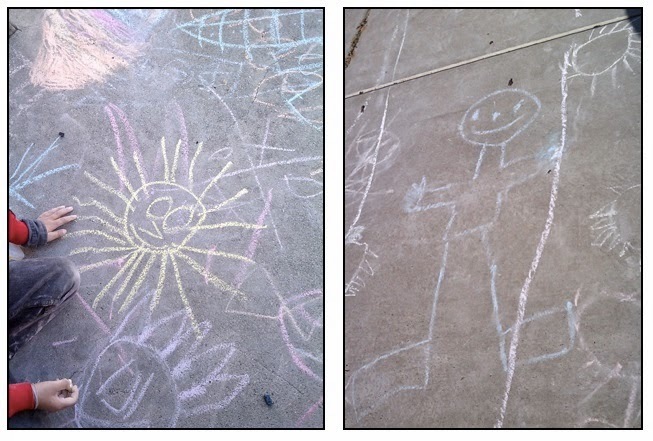 These two sidewalk chalk drawings were done by Kindergartners at recess on two separate occasions. In each case, no adult told them what to draw, how to draw it, or made any suggestions. I love the sun's rays and am impressed by their evenness of distance from each other as well as their length. And the sun's face is just too cute! The drawing of the person was done on a cloudy day when rain was threatening. It is hard to tell from this photo, but the drawing was much larger than life size, stretching across the sidewalk to a length far beyond the height of its artist. But one does not need to be a kindergartner to enjoy sidewalk chalk art. Just today, taking a short break between starting and finishing this entry, I stepped out to the grocery store, and found this drawing on the sidewalk just outside the grocery store door. Considering it's careful symmetry, I'm supposing this was drawn by someone far beyond Kindergarten, a reminder that art really is for everyone, that personal expression can be spontaneous and very public, and that with just a little sidewalk chalk (or a crayon, or whatever!) anyone can make our world just a little happier, just a little more fun, just a little less boring. Seeing this on the sidewalk outside the grocery store was a happy surprise that made me smile. I hope many others smiled when they saw it, too!